Home » Costume of Gambia. Voyage to Africa 1823. The figure dressed in blue is an Alcade, or Governor of a town, the woman with a parasol is a Senhara, or Mulatto (Racial classification). The figures passing at the back are, a traveling Moorish Muslim with his bow and quiver, and his wife and child. Source: Excursions in Madeira and Porto Santo, during the autumn of 1823, while on his third voyage to Africa; by the late T. Edward Bowdich, Esq. Conductor of the mission to Ashanti. Illustrated by sections, views, costumes, and zoological figures. London 1825. Thomas Edward Bowdich (born June 20, 1791 in Bristol, died 10 January 1824 at Bathurst) was a British adventurer, author and zoologist. With the help of his uncle, J. Hope-Smith, the governor of the British Gold Coast settlements, he was employed as a secretary in the service of the African Company of Merchants and was sent to Cape Coast in 1814. In 1817, only three years later, he was sent to Kumasi, king of Ashanti, on a mission to secure British control over the inhabitants of the coast. Especially by the diplomatic skill of Thomas Edward Bowdich it was successfully completed. 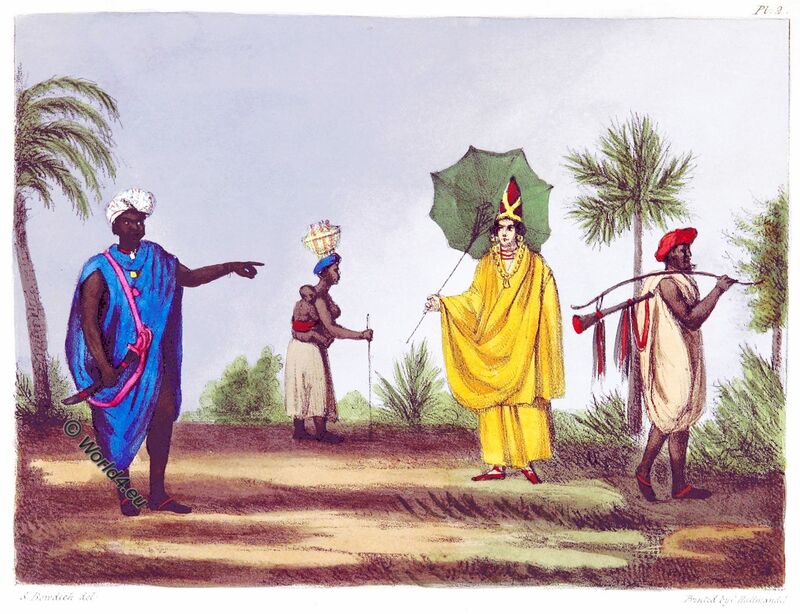 Bowdich returned to England in 1818, and a year later published a report on his missionary mission from Cape Coast Castle to Ashantee, & c. and his observations in Kumasi. He gave his African collection to the British Museum. Bowdich publicly attacked the leadership of the African Committee. His advice was fundamental in taking over direct control over the gold coast by the British government. Bowdich lived in Paris from 1820 to 1822, where he studied mathematics and natural sciences. He had an intimate relationship with Georges Cuvier, Baron von Humboldt and other scientists. During his stay in France, Bowdich wrote various works on Africa as well as scientific works. On 10 January 1824 he died of malaria in a land survey in today’s Gambia.